Firman P03608 3650/4550 Watt Remote Start Generator w/ Wheel Kit - The FIRMAN 3650 Watt Generator has the FIRMAN OHV engine that provides longer life, higher performance, lower maintenance. The engine is cast iron sleeved for long durability with automatic low oil shutdown protection. The conveniently located multi-featured control panel has a FIRMAN custom designed outlet cover that protects outlets from dirt, dust, and debris. For less re-fueling, this generator has the largest tank in the industry for extended run-time with a built-in tank gauge for convenience. The P03608 also has a quiet muffler and a high leverage single folding handle with grip for easy maneuverability. Starting is as simple as the push of a button on the remote start key fob from up to 168 feet away. The durable, compact tubular roll cage frame design is built for years of use. Just add gas. Everything you need comes standard in the box. 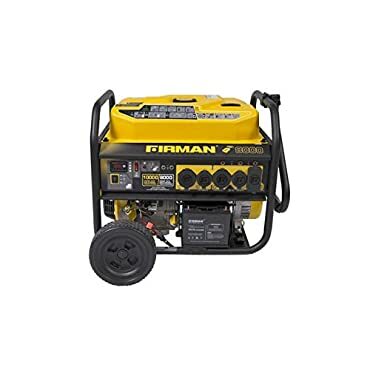 Gas-powered portable generator with remote start 8,000/10,000 watt FIRMAN OHV engine (Max-Pro Series) 8.0 gallon fuel tank, runs up to 14 hrs. at 50% load Low oil level warning system Heavy-duty steel tubing Lightweight design 74dB noise level 50 amps. Home > Home Improvement > Tools and Hardware > Generators and Power > Generators. Home Improvement > Tools & Equipment > Generators. Last updated: April 18, 2019 at 11:34 EST. Pricing information is provided by the listed merchants. GoSale.com is not responsible for the accuracy of pricing information, product information or the images provided. Product prices and availability is subject to change. Any price and availability information displayed on amazon.com or other merchants at the time of purchase will apply to the purchase of the product. As always, be sure to visit the merchant's site to review and verify product information, price, and shipping costs. GoSale.com is not responsible for the content and opinions contained in customer submitted reviews.